To ensure that RGT is able to provide guitar teachers with as many resources as possible, we are continually assessing what we offer and looking at ways of providing greater choice to guitar teachers and their students. The existing RGT electric guitar grades have been popular for many years now, as they provide an ideal method of teaching the technical elements of electric guitar playing in a structured way, whilst enabling teachers to incorporate any songs and music styles that they, or their students, wish. When the RGT acoustic guitar syllabus was introduced, the inclusion of performance pieces proved popular and teacher feedback was that there was a demand for a rock guitar syllabus that also incorporated pieces. Consequently, Tony Skinner and myself, and numerous other members of the RGT team, spent a few years researching and developing such a syllabus – and I provide an overview of it in this article. But, one important thing to stress from the outset is that the new rock guitar syllabus is in addition to the existing RGT electric guitar syllabus – it is NOT replacing it. So teachers now have the choice of which RGT syllabus they wish to enter their electric guitar students for – the new specialist rock guitar grades or the broader more comprehensive electric guitar grades, or students could even take exams in both. Click to learn more about Rock Guitar Exam Registration and Fess, and check out our article on Rock Guitar Performance Awards for more information on award exams. 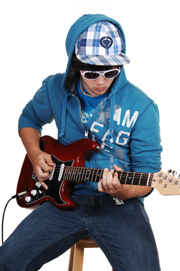 The new Rock Guitar Playing syllabus has 10 exam levels: Initial Stage, Preliminary Grade and Grades 1 to 8. The emphasis throughout is on developing rock orientated playing skills and techniques. Each exam includes a Prepared Performance component, from Preliminary Grade onwards there is also an Aural Assessment component, and from Grade 1 onwards there is an Improvisation component. The first stage of putting together this new syllabus involved undertaking a large survey of guitar teachers to determine which rock songs are most popular with teachers and their students. We had a massive response to this survey, and this enabled us to assemble a hitlist of popular rock songs and target them very specifi cally to an appropriate grade. The pieces that have been included for Grades 1 through to 5 have all been specifically and carefully arranged by RGT to reflect the technical standards that a candidate would be expected to achieve at each grade. The main riffs and characteristic elements of each track have always been included to ensure that each arrangement sounds authentic to the original artist’s version. Sometimes these parts have been simplifi ed to ensure their playability for the grade, and occasionally the key has been changed to make the arrangement more straightforward. In some pieces you might find that, for instance, a barré chord has been replaced by an open position chord. The guitar solos that appear on the original artists’ recordings have mostly been omitted as these tend to be of a much higher technical standard than the remainder of the song. Instead, the assessment of a candidate’s lead playing is covered by the improvisation section of the exam. For Grades 6 to 8 we have provided lists of carefully selected existing transcriptions of tracks that are appropriate for each of these grades – these are accurate transcriptions of the original artist’s recordings. The pieces for Initial Stage and Preliminary Grade are all specially-composed rock instrumental tracks. These tracks have been carefully written to sound effective and be exciting for novice guitarists to perform. The Initial Stage and Preliminary Grade handbooks contain the notation and audio tracks for all the pieces at these levels. For copyright ownership reasons, the notation and audio tracks for the arranged pieces at Grades 1 to 5 cannot be included in the RGT grade handbooks. Instead, all the performance pieces for Grades 1 to 3 are included in the book/ CD: Graded Guitar Songs – 9 Rock Classics for Beginning Level Guitarists. All the performance pieces for Grades 4 and 5 are included in the book/CD: Graded Rock Guitar Songs – 8 Rock Classics for Intermediate Guitarists. 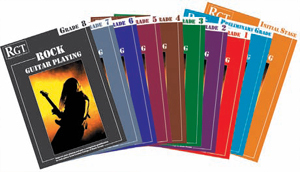 The Grade 6 to 8 handbooks provide a list of recommended publications that include the notation and backing tracks for the suggested performance pieces at these grades. When compared to the existing RGT electric guitar syllabus, apart from the inclusion of performance pieces in the new rock syllabus, the other main difference might seem to be that there is no separate section to assess scales and chords. However, this does not mean that scales and chords are not tested: the rock exams have been designed in such a way as to make knowledge of, and use of, the core scales and chords used in rock an integral part of the exams. For example, at Initial Stage, all the set pieces are based on two open position scale types (A natural minor and E pentatonic minor) and the pieces are split into two groups according to the scale they are based on. Candidates have to play one piece from each group and will, therefore, need to learn both scales to effectively understand and master each piece; the same approach applies to the chords that are included in these compositions. And of course, for the improvisation section, students will need to learn the relevant chords and scales in order to be able to perform an effective lead solo and demonstrate their rhythm playing skills. So scales and chords will still need to be taught and learnt, it’s just that they will now be assessed during the exam within the musical performances, rather than having to be played separately. Initial Stage: perform 2 pieces from the grade handbook. Preliminary Grade: perform 3 pieces from the grade handbook. Grades 1 to 3: perform 2 classic rock pieces from the Graded Guitar Songs – 9 Rock Classics for Beginning Level Guitarists book. Grades 4 and 5: perform 2 classic rock pieces from the Graded Rock Guitar Songs – 8 Rock Classics for Intermediate Guitarists book. Candidates may, if preferred, substitute a free choice piece for one of the listed pieces. Grades 6 to 8: perform 3 rock pieces. These can be selected from the performance lists in the grade handbooks, or any or all of the pieces can be free choice if preferred. From Grade 1 onwards, candidates are presented with an 8 bar chord progression that will be played on a backing track that features drums, bass and rhythm guitar. After listening to the fi rst verse the candidate should improvise a lead guitar solo over the next two verses (or three verses for grades 7 and 8). The rhythm guitar then drops out of the backing track and the candidate switches to rhythm playing for the remaining two verses (or three verses for grades 7 and 8). Each chord progression consists of chords grouped together into appropriate keys; the range of chords is detailed in each grade handbook. Each handbook also provides the recommended scales that could be used to improvise over each progression type. At Preliminary Grade candidates are given two tests: repeating the rhythm of an unseen riff and identifying which of two notes is highest in pitch. repeating the rhythm of a riff and then repeating the notes of the riff. recognising chord types and, from Grade 4 onwards, playing along to an unseen chord progression. Having had an overview of what is required for the new RGT rock guitar exams, here’s a look in a little more detail at the Prepared Performance and Improvisation components. At Initial Stage and Preliminary Grade the handbooks contain the notation and audio CD for six specially composed instrumental pieces. These are all rockorientated in style and have been composed using a combination of open position scales and chords, and so are a great teaching tool for students learning and applying these early stage chords and scales. The pieces are split into groups according to the scale that they have been based on. Candidates perform one piece from each group, thus ensuring students will need to learn all the scale and chord requirements. The CDs that accompany these two handbooks contain each track played in full, as well as a backing track for candidates to practise playing with. The recordings have been produced with a current, rock-orientated sound and are designed to encourage novice players to get playing, have fun and develop their skills and technique. What better way to motivate and encourage new players than to get them playing along with a full rock band. Candidates need to select and perform two pieces at each grade to perform over a backing track. As mentioned earlier in this article, the arrangements for these pieces are contained within the book: Graded Guitar Songs – 9 Rock Classics for Beginning Level Guitarists; the notation for these arrangements is not included in the RGT handbooks for any of the grades. As well as the notation for each piece, the Graded Guitar Songs book also includes a CD that features each track being performed in full, as well as a backing track for candidates to practise with prior to the exam. Candidates may use either a clean or distorted sound for their prepared performances and are not required to replicate the exact sound that is used on the recording. On each track you will also hear that the vocal melody line of the song has been recorded quietly on guitar: this has been included purely as a guide to where in the song you are and can prove invaluable as a cue to the start of each section of the piece. Candidates select and perform two pieces to perform over a backing track. At these grades candidates may, if preferred, substitute a free choice piece for one of the listed pieces. Any free choice piece should also be performed with a backing track and should be of a similar standard to the pieces listed for that grade. The piece should not exceed 5 minutes duration and can be the candidate’s own composition, so a good opportunity to get creative and encourage your students’ compositional skills as well. 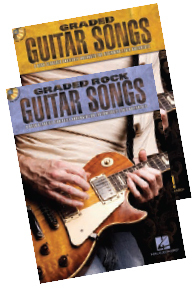 The notation and audio for all the suggested tracks at Grades 4 and 5 is contained within the book Graded Rock Guitar Songs – 8 Rock Classics for Intermediate Guitarists, and not within the RGT grade handbooks. These tracks are all ideal for your students that need GCSE performance material. At Grades 6, 7 and 8 candidates need to perform a set of three rock pieces; the handbooks specify what the minimum and maximum duration should be. As an example, the Grade 8 performance should be a maximum of 22 minutes (including any gaps between tracks to change amp settings etc). Each handbook provides a performance list of songs, as well as names of the publications that contain both the transcription and a backing track for each piece. Examples of songs include ‘Parisienne Walkways’ at Grade 6, ‘Samba Pa Ti’ at Grade 7 and ‘Satch Boogie’ at Grade 8. However, there is no requirement to perform any of the pieces listed as, for these higher grades, any of the pieces performed can be free choices if preferred. This makes for a very flexible section, with candidates able to select pieces to perform that are most suited to them. Any free choice pieces should be of a similar standard to those presented in the performance list provided in the handbook, as this gives an indication of the standard of playing expected at the grade. The free choice pieces should, of course, be rock-orientated and should include a variety of rock styles and techniques. Improvisation is introduced from Grade 1 onwards and involves candidates demonstrating their lead and rhythm playing skills to a backing track that plays a previously unseen chord progression. It is in this section that the knowledge and application of chords and scales will be assessed, as the appropriate selection and application of these is essential here. The chord progressions are carefully structured according to the grade, with new scales and chords being introduced to ensure a steady development of players’ skills and techniques as they progress through the grades. For instance, at Grade 1, candidates are expected to be able to improvise using any of the following 2 octave scales: A pentatonic minor, E blues, G pentatonic major. By Grade 4, candidates are expected to be able to improvise using the following 2 octave scales, in one fingerboard position, in any key: natural minor, pentatonic minor, blues scale, major and pentatonic major. By Grade 8, improvisation using these scales in fi ve positions across the fi ngerboard is expected. Five or more examples of the improvisation chord charts are provided in each of the grade handbooks and the example backing tracks themselves can be downloaded from www.DownloadsForGuitar.com. The cost is only £2.70 for a full set of ALL the backing tracks for a grade. Teachers can also obtain a multi-use licence of 10 copies of the backing tracks for any grade for £17, or 30 copies of the backing tracks for any grade for £37. Examples of all the aural assessment tests are also available to download from the same website. Do you have a question about the RGT Rock Guitar Exams? Post our thoughts or queries in the comments section below. When pupils are performing suggested pieces are they expected to play all written fills and solos exactly as per the transcription or can they improvise their own solo and fills? for example-You Really Got Me-Van Halen at Grade 6, some of the fills and sections of the solo in this are really quite advanced. For the advanced grades we have assessed the suitability of pieces based on the composed elements rather than those that are more obviously improvised. There is, therefore, no requirement to play the solos and fills exactly as per the original. What we are looking for is a level of playing that is appropriate to the grade with regard to the stylistic content as well as the technical proficiency. Hope this helps but do get in touch if you need further clarification here. What are post grade 8 diplomas that Rock Guitar Guys can do? Hey, you can find those exams at this link.